Tim DeCristopher, a founder of the Climate Disobedience Center, stepped on a stool in the middle of the conference room. The Bureau of Ocean Energy Management (BOEM), an agency within the Department of the Interior, was holding its public meeting on the Trump administration’s offshore drilling plan, a plan that would completely dismantle the Obama Administration’s protection of coastal regions. In April of last year, Trump announced the plan to open up nearly all United States coastal water to petroleum drilling—in the North Atlantic oil drilling had stopped over 30 years ago. On January 4 of this year, Secretary of the Interior Ryan Zinke released the 380-page draft proposal, which would open up the North Atlantic to oil leasing in 2021. Following this release, which mandated a 60 day comment period on the proposal, BOEM announced 23 meetings in coastal states, including a meeting in Rhode Island on February 28. These meetings were framed as spaces in which communities could hear from, but not speak with, BOEM representatives about what their plans for the shoreline entailed. The public hearing in Rhode Island, however, quickly transformed into a call and response protest planned out by groups including Climate Action RI and Resist Hate RI. While BOEM representatives stood resigned in the periphery, many on their phones, 42 speakers, including children, activists, professors, scientists, and religious leaders, stood up on a stool and delivered short stump speeches, the encircling crowd repeating and amplifying their words. Those testifying spoke on a range of issues, such as coastal communities, marine ecosystems, Rhode Island’s fishing community, and global climate change. The slogan “keep it in the ground!” brought out the most fervor in the audience, as the collective volume rattled the room. Protesters frequently criticized the possibility of a power plant in Burrillville and a LNG (liquefied natural gas) plant in Providence itself, plans which threaten the health of predominantly low-income communities of color. State Representative Carol McEntee spoke and displayed a letter criticizing drilling, signed by 54 other State Representatives. Towards the end of the meeting, BOEM’s Chief Environmental Officer Bill Brown decided to engage with the audience, but remained bureaucratic in his responses, directing the protesters to provide online comments at the laptop station. Brown stated that the format of the meeting was designed so that participants could talk to BOEM representatives individually for hours, instead of just giving short speeches to the crowd. At the end, protestors filed out of the room, led by Sister Mary Pendergast, a member of the Sisters of Mercy, repeating one line: “We and the sea are one.” While Zinke’s proposal has drawn impassioned response from coastal communities all along the Northeast, it remains unclear which messages have reached the ears of BOEM or the administration more broadly. Duane Clinker, a former organizer and pastor, criticized the nature of the meeting while giving his speech. “I want to be a witness against the corruption of democracy. I come from a time, like some of the brothers and sisters here, when we had actual, official public hearings… Now this system requires us to write little messages on pieces of paper and hand it in to the teacher, believing that it will be read. But we don’t get to hear each other. We don’t get a sense of our power. These bogus hearings are meant to convince us of their power.” Younger protesters nodded their heads and murmured in agreement, and some of the older members shouted in approval. “It seems to me that every time I turn around there’s an oil spill,” said Gene McDonald at the hearing. Each year, around 880,000 gallons of oil are spilled from US offshore drilling. The 2010 Deepwater Horizon oil spill alone spewed 210,000,000 gallons of oil into the Gulf of Mexico. For Rhode Island’s 100 beaches and 400 miles of shoreline, the effects of an oil spill on marine and coastal ecosystems could be devastating. For Rhode Island businesses, the total value of the maritime industry (fishing, boating, seafood production) amounts to $2.2 billion in sales and $118 million in tax revenue, and the tourism industry alone brings in $5.2 billion. Rhode Island is also home to the nation’s first offshore wind farm, the Block Island Wind Farm. Establishing oil rigs and oil infrastructure along the Rhode Island coast would disrupt these industries at best, and catastrophically decimate them at worst, if a spill were to occur. And all this does not take into account the environmental harm caused by burning fossil fuels. For many Rhode Islanders, memories of the deeply polluted Narragansett Bay, which took citywide mobilization to clean up, remains fresh in their mind. These memories find no place in calculations like the ones BOEM has conducted for the net value of North Atlantic oil and natural gas, which claim to compute the project’s economic and environmental burden. While these calculations figured that drilling on the North Atlantic coast was safer than similar operations in the Gulf of Mexico, these estimates also failed to account for important environmental considerations. Chiefly, whereas the Gulf of Mexico’s ecosystem has unfortunately adapted to frequent oil spills, such an event would wreak havoc on the ecology of the North Atlantic coast, which has thus far been spared from such disasters. “I am a climate scientist and an oceanographer at Brown University. And first, let me tell you the science side,” said Baylor Fox-Kemper during the hearing, as he went on to discuss the consequences of expanding drilling while rolling back drilling regulations. In an interview with the Independent, Fox-Kemper continued, “The difficulty is when we contemplate how bad climate change could possibly be, even burning the known resources we have will get us into a lot of trouble. Going to other places and finding new resources really is problematic.” Fox-Kemper also advocated for more jobs in the wind energy sector, which he stated would provide similar job opportunities to those made available by the oil industry. According to the Director of the Center for Energy and Environmental Studies at Boston University, the most optimistic scenario of Trump’s proposal would cause the US to produce only an additional two to four million barrels a day, still leaving the US with an import deficit. Even with new drilling, the the Department of Energy estimates that oil imports would be reduced by a mere 2.5 percent in 2030, at which point America’s offshore potential would be reaching exhaustion. Moreover, while this proposal has been cast by the administration as a shift away from Saudi oil imports, the vast majority of American oil in fact comes from North America itself. Trump and Zinke’s plan has been met with near-universal disdain. Ralph Faust, former general counsel for the California Coastal Commission, stated that at this point it “just seems like grandstanding.” Over 15 coastal governors (including Gina Raimondo), five of which are Republican, have expressed opposition to this plan. The Republican governor from Florida, Rick Scott, has gained exemption from Secretary Zinke from the plan, quite possibly due to currying favors with the current administration in the past. Pundit speculations regarding even the oil industry’s interests in Trump’s plan, especially in the North Atlantic coastal region, have been mixed. In an interview with Reuters, Neal Kirby, a spokesman for the Independent Petroleum Association of America, said his members support the administration’s drilling plan. He quickly added, however, that the industry was primarily interested in the Eastern Gulf of Mexico, a region close to existing oil infrastructure and highly-productive fields. Sam Ori, executive director of the University of Chicago Energy Policy Institute, warned in an interview with CBS about underestimating the potential of the oil industry to expand to all the new proposed regions, which includes the North Atlantic. Drilling in the North Atlantic stopped over 30 years ago due to lack of success, and still remains a relatively undesirable area for exploration. However, drilling demand cannot be fully understood until leasing actually begins. “I’m a merchant mariner, and I’ve sailed the oceans all my adult life—25 years,” said Logan Johnsen during the hearing. Johnsen grew up in Duluth, Minnesota in a family full of sailors, and always felt attached to, as he described, the “wine dark sea.” Currently, he works as a first officer on the RV Neil Armstrong, an research ship operated by Woods Hole Oceanographic Institution, and lives in the East Side with his family. “I’ve seen the boom and bust nature of the oil industry,” Johnsen said during the hearing, “promising all kinds of economic effects but then going bust.” In an interview with the Indy, he stated, “When oil is $100 a barrel, everybody’s drilling, money’s flowing just like oil. Then the cost of oil goes down to $60 a barrel, and everything comes to a grinding halt. 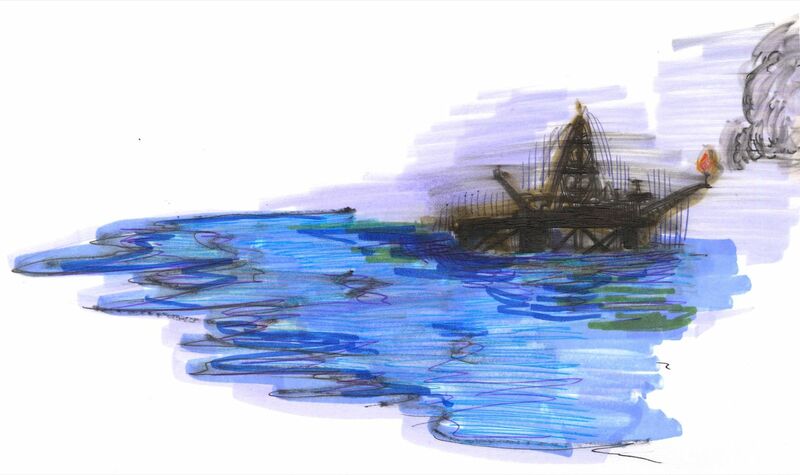 Massive layoffs, ships are laid up.” Rusting rig infrastructure is often left behind during busts, such as wellheads that are about five meters under the surface and are sometimes unmarked on maps. “They could put a hole in your ship,” Johnsen said. Although profoundly aware of the crises the ocean faces, Johnsen shed light on the drastic improvements he has seen over the years. When he first started out on the sea, Johnsen said, “you didn’t even have to know how to navigate. You could just follow the oil slicks.” He also called oil rig safety standards “exemplary,” in that “you can’t even throw away a cigarette, or an apple core overboard on a rig. That’s not tolerated.” Johnsen mentioned a time when ships would unload all of their garbage into the ocean without second thought. However, while standards on the oil rigs are strict, the larger environmental effects that oil drilling causes continue to grow. “What is tolerated,” Johnsen said, “is the cost of doing business.” A cost which explicitly includes immense carbon emissions. He argues that as long as these oil companies are generating revenue and insurance compensations, they will continue to increase drilling. Johnsen provided a view of BOEM not discussed at the hearing, which was that BOEM is in charge of not only leasing offshore drilling, but also wind farms—Johnsen sees possible alliance in BOEM (since 2009, BOEM’s office of renewable energy programs has issued 13 commercial wind energy leases offshore). “We have the capacity to be a viable port for offshore wind farming, and it’s a lot less intensive, because it’s automated,” Johnsen said. Moreover, he stated that Rhode Island’s economy would not drastically improve with new oil rigs: according to Johnsen, there is simply not a trained contingent of oil workers in Rhode Island, so if offshore drilling were to come, workers would be outsourced. Wind farming, on the other hand, would be much more sustainable in regards to local job creation, less constrained by market dynamics, and much more environmentally friendly. Recently this battle has been taken up in state legislatures. Rhode Island State Senator Dawn Euer and State Representative Lauren Carson have introduced bills that prohibit any offshore oil infrastructure within state waters, as well as on the mainland. Every US Senator and Representative from New England has endorsed Rhode Island Representative David Cicilline in his New England Coastal Protection Act, which is currently being worked on in congressional subcommittee. In California, the California States Land Commission announced that it would ban the construction of pipelines in state waters (up to three miles from the coast), which would presumably deter oil companies from establishing rigs further out in federal waters. Rhode Island officials also plan to utilize its 2010 Ocean Special Area Management Plan (SAMP), a powerful rulebook for managing offshore waters, which had previously allowed Block Island Wind Farm to come to fruition. The Coastal Resources Management Council (CRMC), the state agency that facilitated the Ocean SAMP, plans on using the Ocean SAMP purview to stymie intrusion into North Atlantic Waters. And on the ground, incredible work in education and advocacy is being done among local activist groups, such as Climate Change RI, Surfrider RI, and the Rhode Island Student Climate Change Coalition, who will continue to fight the proposal along every step of its implementation. However, even with this diverse contingency of support, the fight to “keep it in the ground” will continue to find opposition from above. Kion You B’20 is one with the sea.